He noticed that Tom's forehead was unusually wide and his head was bigger than normal. He made no secret of his belief that Tom’s brains were scrambled! 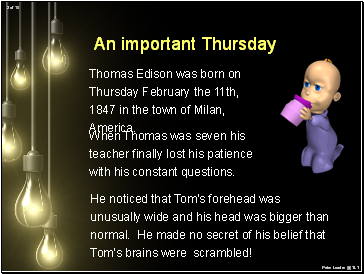 Thomas Edison was born on Thursday February the 11th, 1847 in the town of Milan, America. When Thomas was seven his teacher finally lost his patience with his constant questions. I turn the lights on and play Eminem! 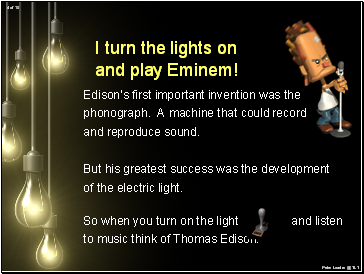 Edison’s first important invention was the phonograph. A machine that could record and reproduce sound. But his greatest success was the development of the electric light. 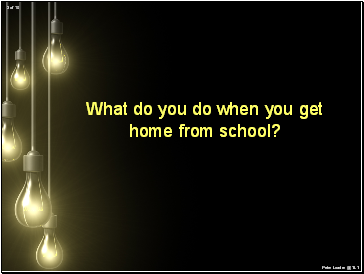 So when you turn on the light and listen to music think of Thomas Edison. As electricity spread around the world. 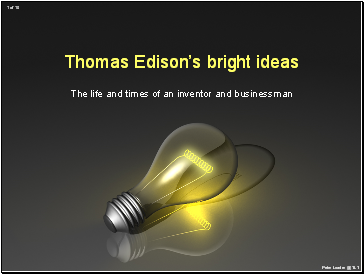 The success of his electric light brought Thomas Edison to new heights of fame and wealth. 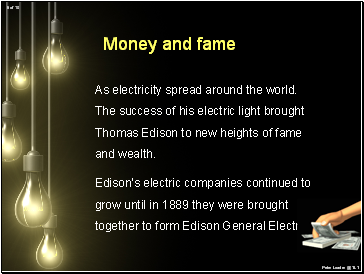 Edison's electric companies continued to grow until in 1889 they were brought together to form Edison General Electric. In 1884, during this period of success, Tom's wife Mary died. A year later, while on holiday at a friends house in New England, he met Mina Miller and they fell in love. 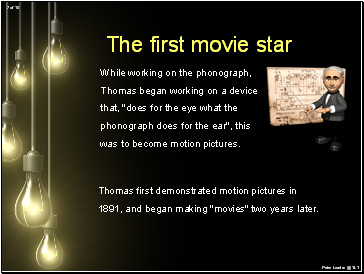 While working on the phonograph, Thomas began working on a device that, "does for the eye what the phonograph does for the ear", this was to become motion pictures. Thomas first demonstrated motion pictures in 1891, and began making "movies" two years later. 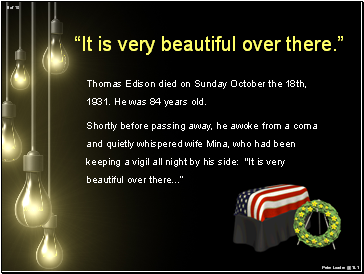 Thomas Edison died on Sunday October the 18th, 1931. He was 84 years old. 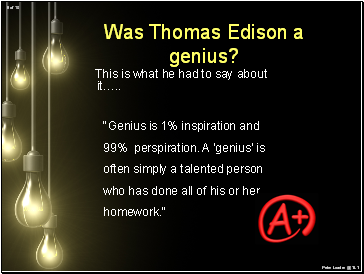 Was Thomas Edison a genius?